Mr. Misadventures promises that once we get better light (it has been overcast and raining the last couple of days) that he will take professional photos of the interior of the RV. In the meantime, I have taken a few shots with my iPhone, enough to allow a sneak peek and give you a “design” update. 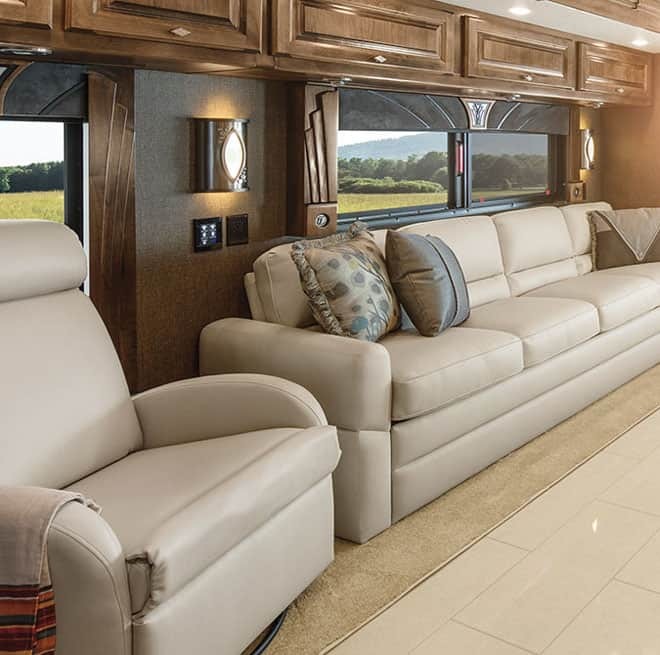 We purchased a Tiffin Phaeton Class A Motorhome, our interior floor plan model is a 40 AH (as in 40 feet). I am not sponsored by Tiffin (I wish! ), we made a down payment and have a mortgage (because buying an RV is like buying a home rather than a car, at least in the bank’s eyes!). The photo is a bit small, if you are interested, you can see it on the Tiffin website. 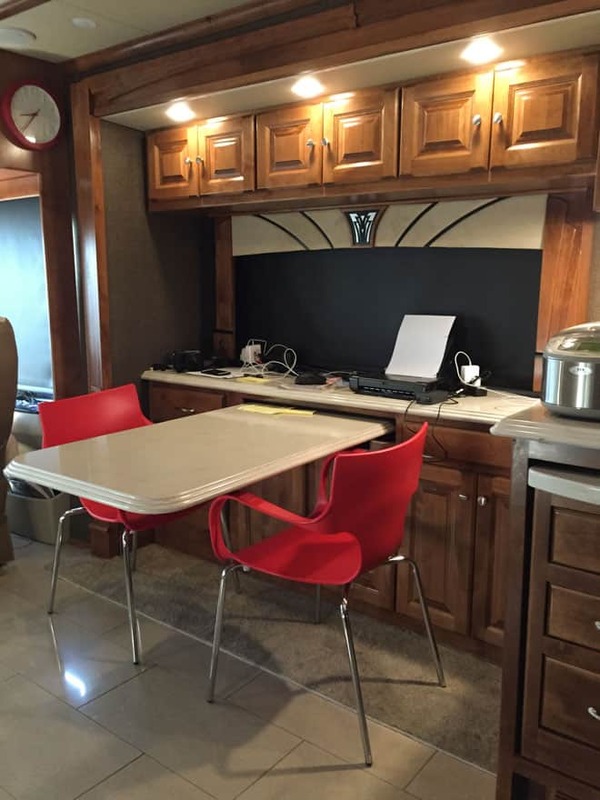 We have the version that has the dinette with the computer workstation. And we have the English Toffee color scheme, not our first choice, but the floor plan was a higher priority. According to the Recreation Vehicle Industry Association and a couple of other sources I reviewed, the current average age of an RV owner is 48 which based on just 3 months living in this thing and being around owners, seems way off. What I can tell you is that I don’t think that the RV manufacturers have caught up to that 48 year in terms of style! I just turned 46 and my hubby is in his mid-50’s and we think the interior decor is U-G-L-Y! Don’t get me wrong, despite my newly found addiction to HGTV’s Property Brothers (it is dangerous having Dish Network and 4 TVs in this rig! ), I am totally not the renovation/interior design person that is going to transform our recreational vehicle into something that can be shared in Dwell. But, Mr. Misadventures and I are doing our best to add personal touches. Also, we don’t know how long we will have our RV so we don’t want to make a lot of permanent changes in our first year, better for the resale value. Now it is just gone. We’ve replaced them with these chairs from Amazon which are much lighter and more modernly designed in red which gives us a pop of color (and red is my favorite color!). Sorry the lighting is so dark, like I said it has been overcast. Also, we are still figuring out how cord management is going to work for the office stuff. And I had the shade pulled down (the reason why Mr. Misadventures does the photography!). Without thinking I have gone overboard on the splashes of red, (the toaster isn’t always out, but I am not giving up my Nespresso machine) you can see how the dining runs into the kitchen. Kristin of Camels & Chocolate is sure to pick up on the fact that my rice cooker is front and center. When her and her hubby Scott did a six week road trip in a 5th wheel in 2011 she posted a photo of the inside in one of her posts which also showed her rice cooker. Fellow Zojirushi Rice Cooker owners recognize it immediately – it is the best rice cooker ever! We’ve had this one for close to 7 years, it cooks rice flawlessly and it is an RV owner’s best friend! 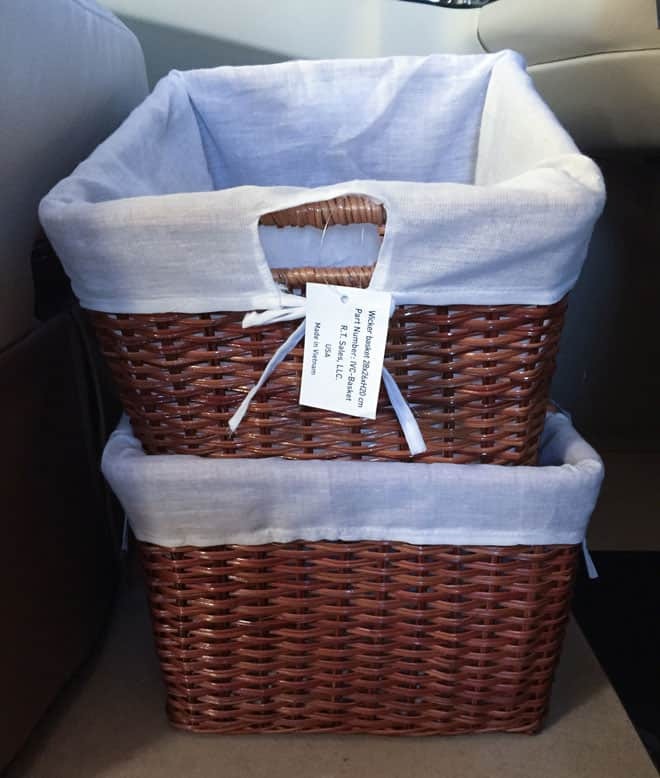 We replaced these ugly wicker baskets in the closet. Pieces of wicker fell off every time you touched them and it drove me crazy! While I am in the closet, here is a peek at my clothes. Mine are the ones on the left that go from the red jacket on the far left to the vest in the middle. That’s it. I have 3 pairs of jeans in one of the drawers below the plastic bins along with sweatpants and the second drawer has hats and gloves, etc. For the next year this is the sum total of my clothes, mainly Patagonia, North Face, UnderArmour and Uniqlo pieces. I have a couple of things that I am keeping at my Mom’s (I’ll need them for speaking at conferences such as WITs, have you got your ticket yet?!) but that’s it. And I love it. For the first time in 26 years I don’t have to worry about what I am going to where to the office! In terms of shoes I have my black and blue Converse on their last legs, so they’ll get tossed out sometime soon; my black and red Tieks; tennis shoes; a couple of pairs of hiking boots in different sizes; and one pair of sandals/water shoes. Lastly, we replaced every single brass knob and handle with brushed steel ones, installed a wifi booster (I need my internet!) and a VIZIO Sound Bar for the TV in the bedroom. Tiffin includes a sound bar with the TV that is outside, yes you read that right, the TV outside, but not on the other TVs, so we bought one. It is not super high end but does a really good job. We need to find a solution for the couch. It is leather (actually I think it is vinyl) and I hate it. I want to cover it, but we have an L-shaped couch because our model has an added pull out chair on the end when the slides are out. Plus it’s a sleeper. All that makes it complicated to find a cover. 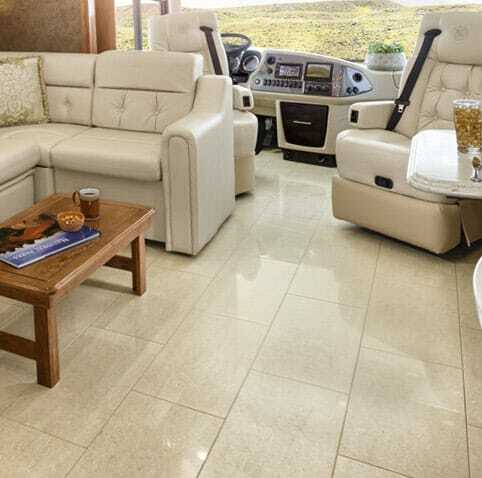 I have seen some great renovations on RV couches but they are usually straight forward bench style couches. I am not crafty, but I am frustrated by this, so we will think of something. We need to buy pillows for the couch, but I won’t get them until I know what color the couch cover will be. Ditto for the ottoman I want, although I found a really cute (and inexpensive) one at Target and I might bite the bullet and get it. We need to find a runner. A long narrow carpet that will work when the slide outs are in. Remove the moldings around the windows. Check out the photo with lounge chair, or the dining chair, or the one with Jessica and look at the wood thing around the window. It is around every single window. They are bulky and ugly! Now that we have confirmation from the manufacturer that they don’t support anything structurally, we want to get rid of them! 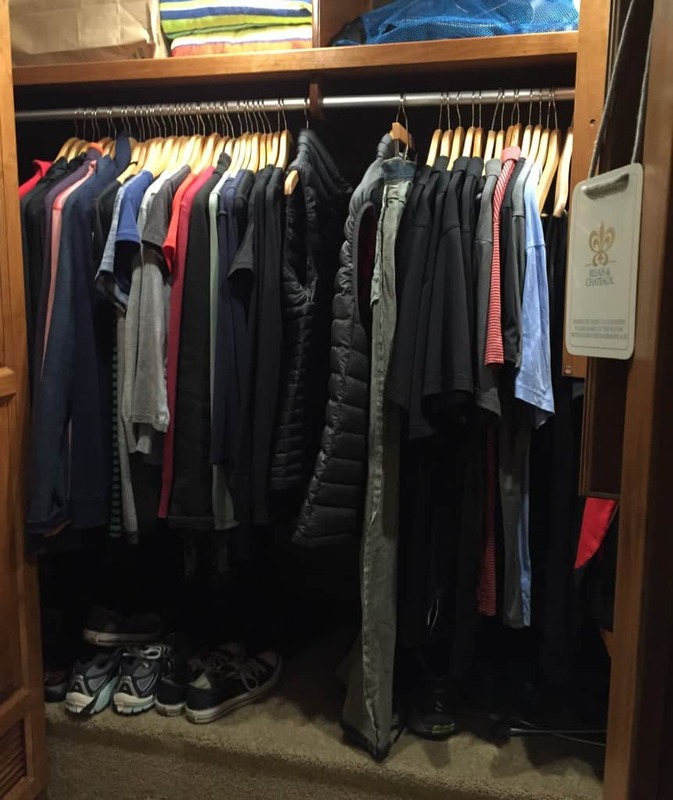 Since we are leaving in about one week, we will probably do it in March when we are back in the Phoenix area and can put them in storage where we have put everything we have removed from the RV. We need to change out the pictures on the wall. We will use the existing frames so as to not create new holes in the wall, but we are definitely changing out the hideous art. We’ll use photos from Mr. Misadventure’s portfolio and that way if we have guests inside we can show off his work. I’d like to change the sconces above the sofa, we just need to find something we like and haven’t found the time. They are kind of growing on me, so I have to wait and see what happens with the couch cover, etc. I would like to cover the captain and co-pilot’s chairs with something less sticky. I am not a fan of leather (or vinyl) and would like to cover them eventually. I’d like to make a window box for Jessica in her space, something low that she can actually climb up on but gives her the opportunity to look out. She is never going to be one of those cats that sits in the dashboard, her poor little legs just can’t make that happen, but a low window box would work. 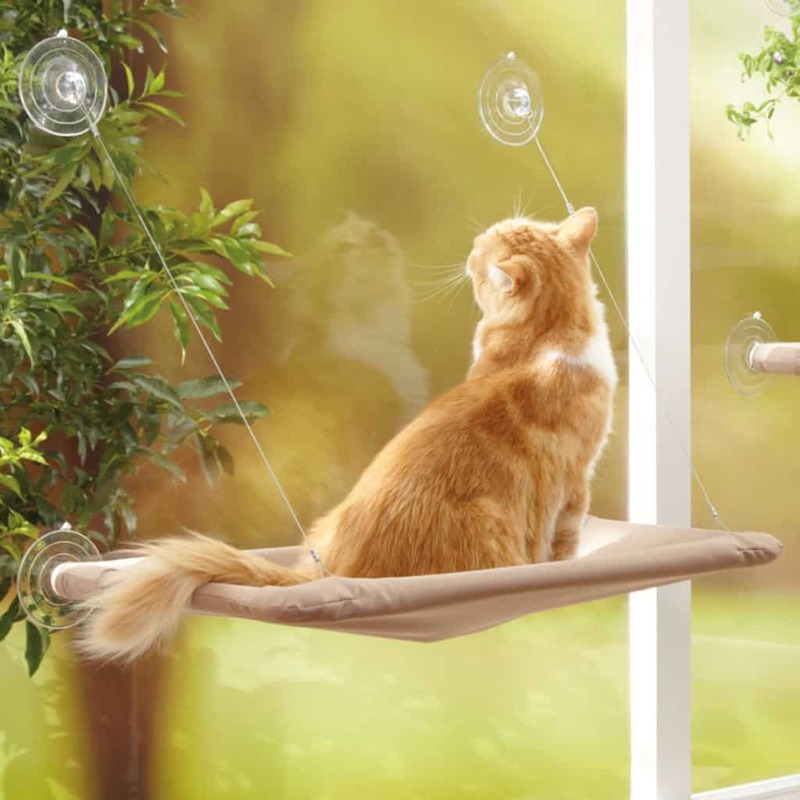 This one looks like it is easy to mount, but I wonder if it really would support a cat’s weight. Most things with suction cups don’t last long! Well that’s it for the tiny peek. I will be back real soon with much better photos once Mr. Misadventures gets them done. How about you? Have you done home, apartment or RV renovations? Where do you source your ideas? What do you like best (or hate the most) about redecorating? Ahh the post I’ve been waiting for! That is SO spacious! That rice cooker is huge, but the non-stick coating on my old little rickety thing that we’ve had for 10+ years is finally starting to peel off and I’m sure that’s not good to ingest, so I’ll keep this one in mind. So here’s the thing. 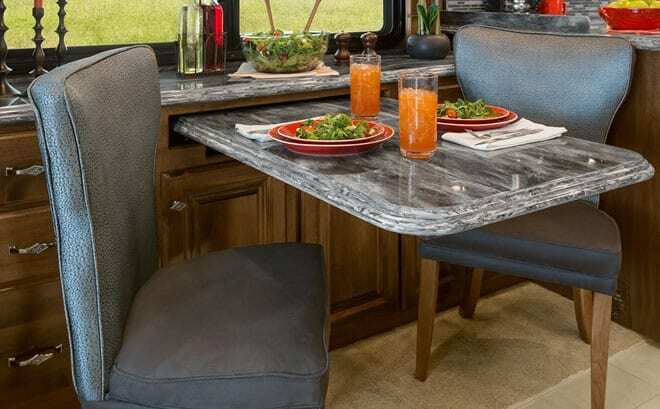 I, too, think RV interiors are insanely ugly. They either look like the lobby of a vegas hotel or a set from the Golden Girls. What gives? For the price of these things (a mortgage doesn’t surprise me at all), why can’t they incorporate at least a *little* style? Or, at the very least, tone down the cheese? I understand they want to stay cost effective, but I swear the people who design these interiors must be a room full of 70-year-old men. I’m sure you can get decent fabrics for the same cost as vinyl, and offering a la carte furniture options would be such a great way to personalize the look (and provide the sales associates an opportunity for add-ons.) If I were crafty, I’d start a business that deals strictly with RV interior design. It would be so fun! Unfortunately the manufacturers probably wouldn’t buy in, so it’d most likely have to be RE-design, where poor owners first have to fork out for stuff they don’t want, then get it all replaced/reupholstered. It’s crazy! Anyway, your place still looks amazing. I love what you’ve done to make it your own – Jessica’s spot looks so cozy, and the pops of red make all the difference! @Katie, the designs are just AWFUL, which is why I was so shocked when I did the research on the average age of the owners! I know for one, the owner of the company of the RV brand I have is a 70 year old man and I can imagine most of the other companies have the same – they need to come a long way before the majority of Gen X and any Millenials become of the average age of the buyers. The insides are just hideous. Also, we have 4 TVs but they didn’t think about wifi, to me that is a must have these days. 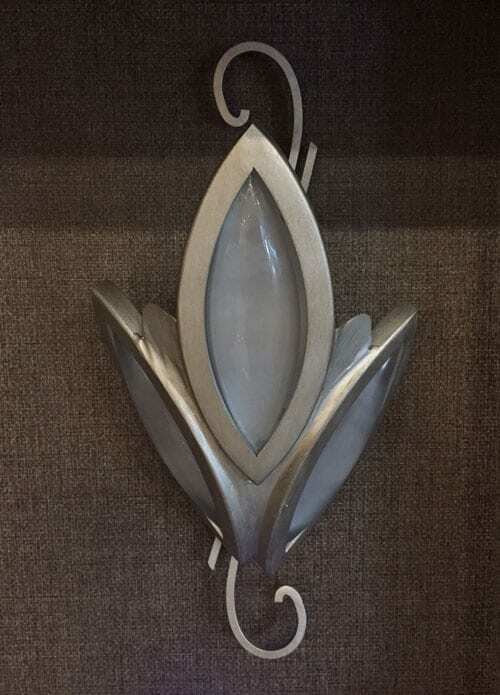 If we think we are going to keep this more than 5 years we definitely will be making a lot more design changes, there are so many really creative folks out there who have done really cool things with their RVs – I am sure there has to be a show (besides that million dollar RV one)! I’m turning 70 in about a month. I’ve taken years of drawing and ceramics classes at the museum school here and traveled widely. My husband and I are building a house and planning it down to the shape and finish of the hinges for the doors. We like simple and minimal. I expect to hear visitors asking when we plan to furnish our new house. That said, I love your blog. I found it while looking for travel information and then saw the design posts, which I have read eagerly. @Ellen, I am so sorry if you felt offended by my agist comment. Design is definitely super-objective and there are lots of “older” people with great taste. Maybe it is the brands that market to a certain generation, but I find that there are style and design aesthetics that I see quite often associated with baby boomers. I live in a retirement community and my hubby is a real estate photographer who photographs home in our housing area and I tell ya 9 out of 10 homes remind me of the inside of those RVs – dark wood, oppressive amounts of furniture, expensive look metals that are actually cheap, it’s terrible! Thanks for the sneak peak!! I’ve never really looked at RVs so this is all new to me. It looks spacious. The sofa is definitely mid-80s home interior and that artwork is horrible but I am sure you will add some stylish touches. Oh my soul, this is a dream! I have literally always dreamed of having an RV one day. It’s crazy how incredibly spacious your’s looks – it’s so clean and open. Seriously in love with the layout! wow! how cool! it is so nice and big inside! Looks like a great rv to be living in. I am not sure that would be enough clothes to get me through for a year. 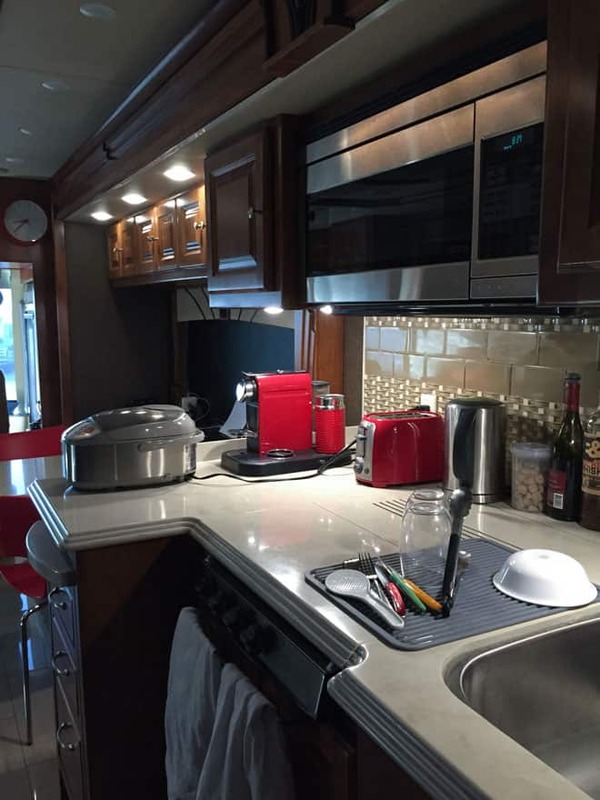 Sounds like some great changes to the rv to make it more you instead of the manufacturer. Your bus looks beautiful to me, and I love how Jessica has a nice spot by the fireplace. We have 2 cats, and as I mentioned, we have discussed doing what you are doing, a number of times. I was so afraid that our cats would not like it. What does Jessica think of it all so far? The sofa is great! I don’t care what anybody else says! When you first mentioned you’d be traveling in an RV, I imagined a cramped space. However, this looks spacious enought to breathe. I like the idea of having minimal stuff, just the necessities. 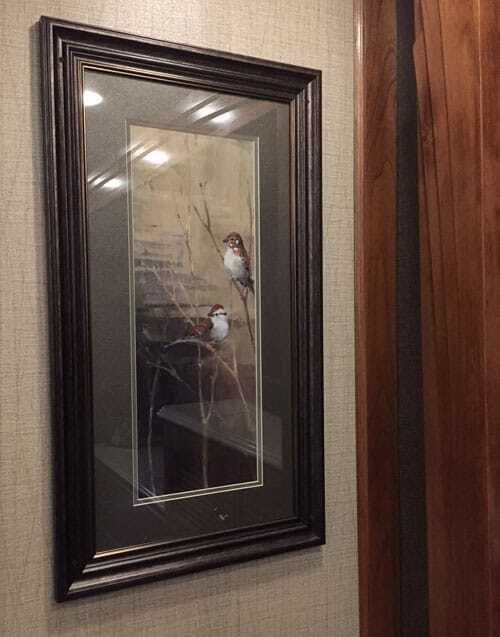 I’ve enjoyed sneaking a peek inside your living space. This RV is so beautiful! It’s so spacious and designed so lovely in every way.My son bought one this summer and we had a great time in it camping. It is my dream to own an RV one day and you’ve really done amazing with this one! Wow, I can’t believe an RV can look so roomy! Oh my goodness, it’s so much nicer than I’ve seen before! How fabulous, and it doesn’t look like you’re living a mobile life much at all, other than the space. Very nice. I like seeing bold color accents such as red over muted colors. The ambiance looked darker but it’s cozier. 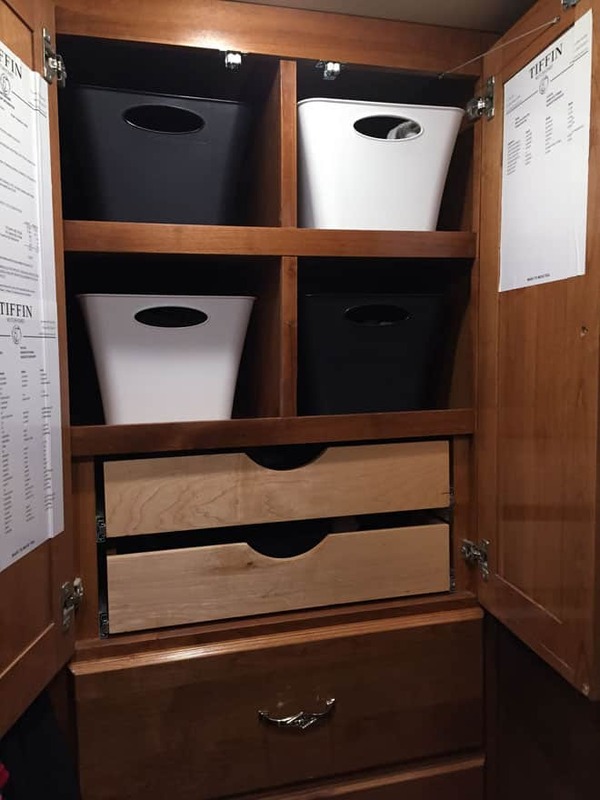 It’s great how you organized your closet with different sections using the drawers and baskets. That’s interesting…I did not know that buying a RV involves a mortgage. I have never been inside of an RV before, but I would like to explore one. It sounds like a really nice way to have adventures across the U.S. Your interior looks fabulous! And, the photos came out nicely to me. When in doubt just throw a cover over it. It might not look great, but unless you’ve got the money to shell out on new stuff you want a great cover can personalize it. Couch looks great to me, love the other personal touches tho. We have always talked about selling our home and buying an RV to travel around the United States in when we became empty nesters. Well we are now those empty nesters and we are watching the years slip by with our plans!! I love your ideas and renovations that you have done!! Space would be my theme in an RV also – so would comfort. THANKS for the ideas and pics! This would certainly make traveling more comfortable. I like that your created space for Jessica, got to have a happy and content cat for your adventures. I’ve been seeing reruns of Road Rules lately, and I could say your RV is somewhere I would live and travel. No wonder your posts are over the top. @Olivine, as they months have progressed we have added her to comfort with steps up to the bed and a water fountain bowl. She is spoiled, but being 15 she deserves it!